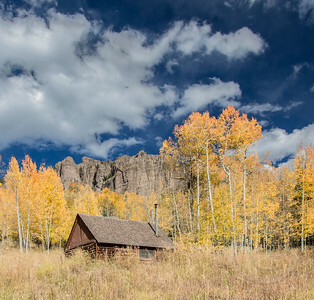 Old log cabin at base of the Pinnacles in Sliverjack Reservoir area, Ridgway, Colorado. Last Dollar Ranch at sunset with San Juan Mountains and Mt Sneffels in background. 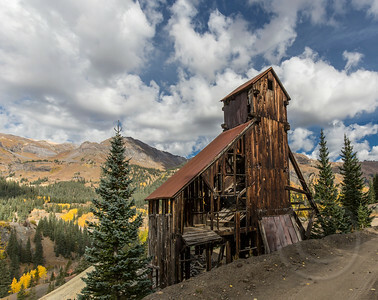 Last Dollar road, Ridgway, Colorado. 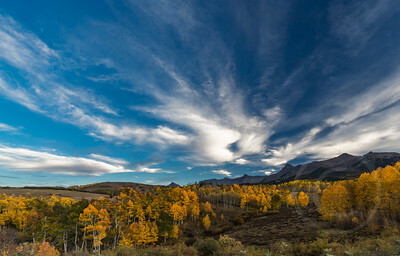 Cloudscape and Golden Aspens in the fall foliage of the San Juan mountains as seen from Last Dollar road, Ridgway, Colorado. 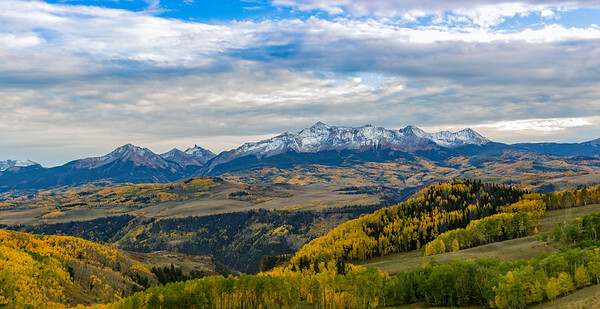 The Mount Sneffels Range is surrounded by golden aspen fall folage and has a new dusting of snow. 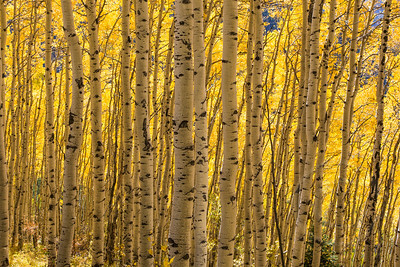 The sun is backlighting the leaves of the aspens bathing the trunks in a golden light. 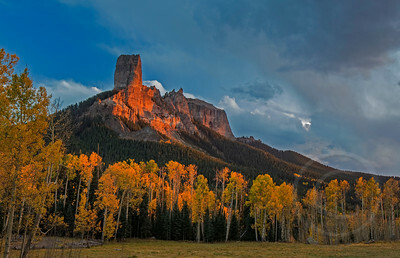 Owl Creek Pass, Ridgeway, Colorado. 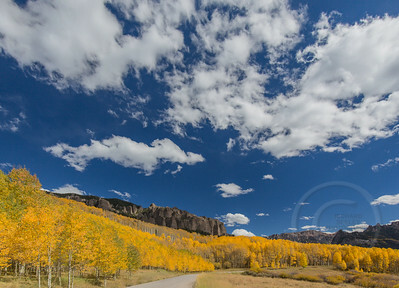 Road to Owl Creek Pass as viewed from Silverjack Reservoir area, Ridgway, Colorado. 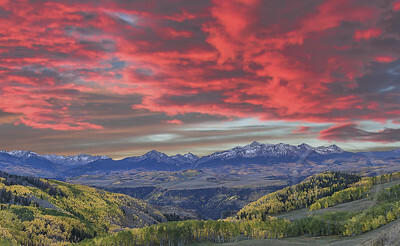 San Juan mountain range from County Road 9 at Sunrise, Ridgway, Colorado. 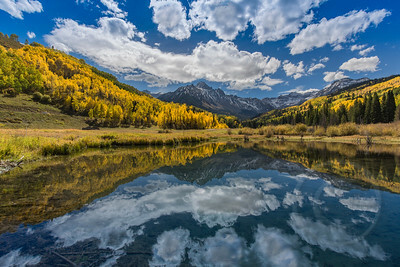 A beautiful view of the Cimarron Ridge in the golden aspen fall foliage as viewed from Silverjack reservoir area, Colorado. 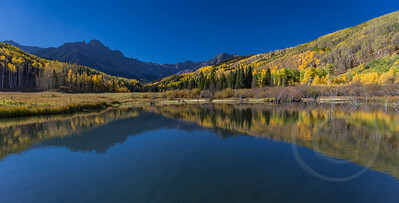 View from Silverjack Reservoir area towards Owl Creek pass in the golden aspen fall foliage, Ridgway, Colorado. 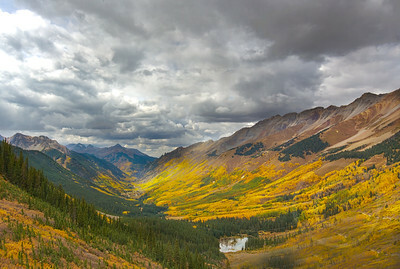 View into village of Ophir from Ophir pass, Colorado. 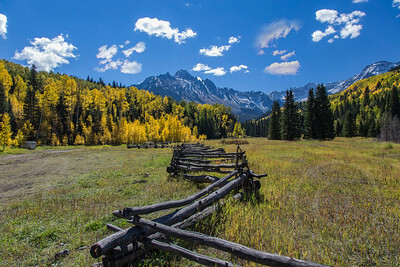 The fall foliage of golden aspen grove stand out like gold paint on the foothills of the Sneffels Range. County road 5, Ridgway, Colorado. 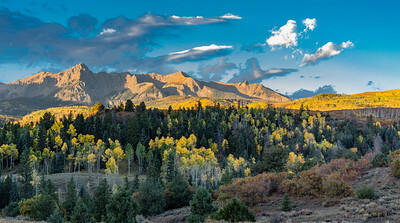 Last Light Last Dollar - The sun set over the San Juan and San Miguel mountain ranges during the peak of the golden colors of the aspens during the fall foliage season. 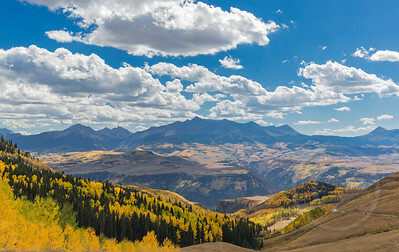 Photographed from Last Dollar Road, Telluride, Colorado. Mt Sneffels and San Juan Range at Sunset - Red sky alert at sunset over the San Juan mountain range and especially Mt Sneffels with a touch of alpenglow. 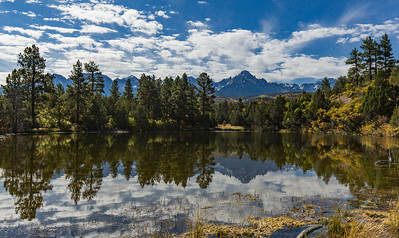 Dallas Divide, Route 62, Ridgway, Colorado. 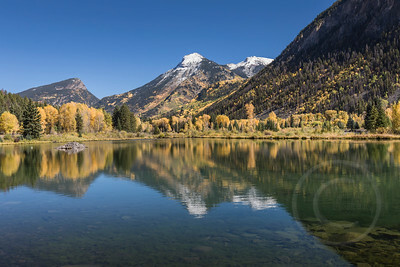 Red Mountain in White - Red Mountain with snow on its peak is reflected in the stillness of Crystal Lake, Ouray, Colorado. 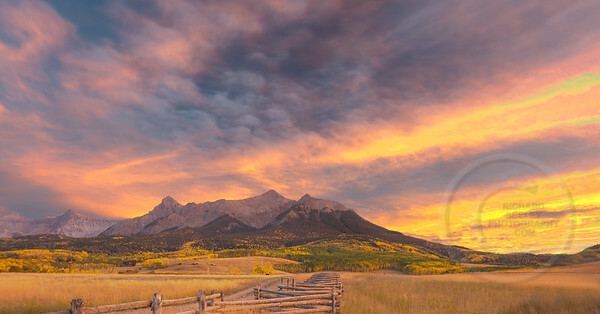 Radio Dog Ranch at Sunrise - The sun rises on the San Juan mountains, Mt Sneffels and Radio Dog Ranch. 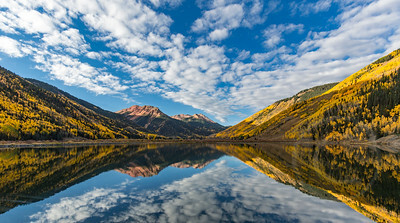 Ridgway, Colorado. 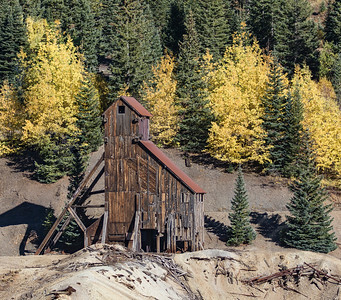 Yankee Girl Mine North Side - The north side of Yankee Girl Mine as seen from the Idarado mine. 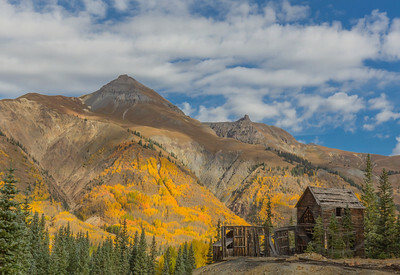 Red Mountain Pass, Ouray, Colorado. 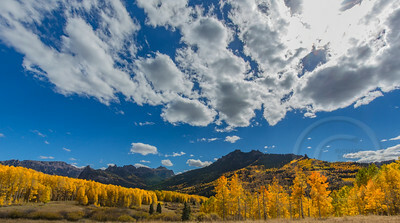 Fiery Fall Foliage - The sun set over the San Juan and San Miguel mountain ranges during the peak of the golden colors of the aspens during the fall foliage season. 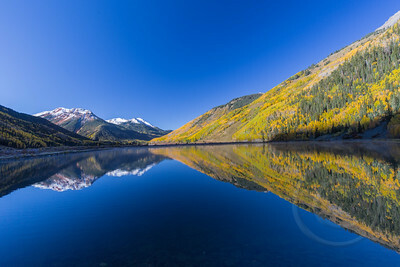 Photographed from Last Dollar Road, Telluride, Colorado.